Liquid Fence, an environmentally conscious company is a Pennsylvania based corporation, which markets, manufactures and distributes various lines of repellents. Our home offices are located in the Pocono Mountains of Pa., with manufacturing and distribution based in Nesquehoning Pa. 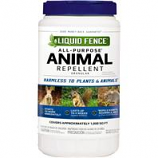 The Liquid Fence Co., Inc prides itself on its ability to offer the consumer all natural and environmentally safe alternatives for repelling unwanted animals. Harmless to plants and animals. Starts to work immediately. Lasts up to 4 weeks against rabbits. Repels rabbits squirrels mice and other small mammals. Covers approximately 1000 sq ft.